First, I have to apologize to all the folks who have nominated me for these fabulous awards. Aside from the first nomination I received (a Sunshine Award, nominated back in January of this year), I have been delinquent in fulfilling the requirements for the subsequent awards. I received the nominations for three of these awards in the same week and was in over my head with work and creative projects and, well, life just got in the way. In an effort to acknowledge those who have so generously nominated me for these wonderful awards and to shine a spotlight on some other blogs, I am combining the requirements into one page. I hope you all are okay with this! 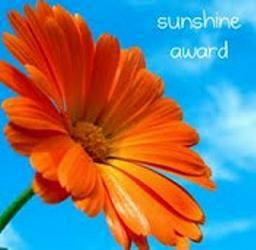 Thank you to Trucker Turning Write for nominating me for a Sunshine Award in April 2014, an award given to blogs that bring a little sunshine into the world! Thanks Frankie! I love his tagline: “Not just checked shirts and honky tonk.” You can find his blog here: http://truckerturningwrite.com/. 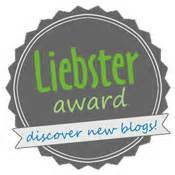 Thank you to my friend Renata at Lilypadheart for nominating my blog for a Liebster Award in May! I had never heard of a Liebster so I was intrigued to learn that it has German origins – the word “liebster” has several definitions: dearest, sweetest, kindest, nicest, beloved, lovely, kind, pleasant, valued, cute, endearing, among others. The award exists only on the internet and is given to bloggers by other bloggers. My fabulous friend Renata –we’re convinced that we were sisters in another lifetime – writes about “living, loving and learning to laugh along the way.” Renata and I became friends through a creative writing course that we took together. She’s a beautiful writer. You can read her compelling posts at http://lilypadheart.wordpress.com/. Thanks so much Sister! Also in May, Debbie at the Doglady’s Den nominated me for a Liebster Award! Debbie has a great blog and her tag line is “Eclectic musings, memoirs, music and more.” She and I became acquainted during the Blogging A-Z Challenge and found we have much in common. Debbie is widely traveled, digs music and dogs and has a fantastic blog. You can find her blogging at http://thedogladysden.com/. Thanks a ton, Debbie! Thank you to Maija Harrington for nominating me for a Liebster Award in June! You can find Maija blogging at http://maijaharrington.com/ where she writes stories about living with her Pugs. Her book is titled Funny Tails: Adventures and Misadventures in Living with Pugs. Best described directly from her site: “Writing with a subtle, self-deprecating sense of humor, she brings you a series of funny, frantic, and sometimes heartbreaking scenes from daily life with her canine clan.” Thanks Maija, for the honor of the Liebster Award! And last week (July 2014) I received yet another nomination, this one for the Wonderful Team Member Readership award, from Marci Koski at Fuzzy Undertones. I had never heard of this award and Marci sent me the nicest message as to why she nominated me: “I’m nominating you for an award because I think you deserve this one! I’d like to pass along the Wonderful Team Member Readership award to you because I really appreciate the passion of your writing and blogging. Animal welfare is very near and dear to my heart and so many of your posts have touched me deeply! I know that most of these awards involve a little work, and if you do not have time to “do” this award, I completely understand; I just wanted to publicly acknowledge you as a valued part of the blogosphere and my blogging community!” Thank you so much Marci! 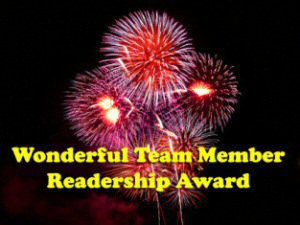 The Wonderful Team Member Readership award celebrates the readers of our blogs. To quote the creator of this award: “As bloggers, we are also readers. That is a part of blogging as listening is a part of speaking.” The award pays tribute to both readers and bloggers as team members. It honors supporters and community building among bloggers. So thank you, dear readers! I’m deeply grateful to you all! And thanks to Marci for nominating me and for being a regular reader of my blog. Marci blogs at Fuzzy Undertones (love that name!) and you can visit her at http://fuzzyundertones.com/. Marci used to be a cartoonist but is now a fish biologist! She also plays roller derby – how cool! She named her blog Fuzzy Undertones because she says her thoughts are sometimes fuzzy. Aren’t we all a little bit fuzzy now and then? Thanks again Marci! I’m so honored to be a recipient of these award nominations. Most of these awards require action in order to accept the nomination. While I understand the concept behind the requirements (helping to promote other blogs through pass-along nominations) they are time-consuming and labor intensive, which is why a lot of folks refuse to accept the awards, as I found out when I received and completed a Sunshine award nomination last year. So with these recent awards, I’m doing mine a little different. Instead of doing all the requirements for each award separately, I’m combining them into one post (some awards ask that you answer a number of specific questions and others require that you list ten to twelve interesting facts about yourself). Then, instead of nominating other blogs in the traditional fashion, thereby asking others to follow the award requirements, I’m going to list a few of my favorite blogs here and also point readers to my blogroll, which lists all of the blogs that I follow on a regular basis. Hopefully this alternative method will suffice for nomination acceptance. I have been adopting rescued and retired greyhounds since 1999. I’m from Niagara Falls, NY. I have a dogsitting business in Austin, TX called The Grey Zone. I will be a fully credentialed and ordained Animal Chaplain in April of 2015. I used to own a bar. I name and talk to my trees. I like muscle cars from the late 60s and early 70s and I still mourn my ’71 Monte Carlo. I am a die-hard Buffalo Bills fan…but truth be told, some years it’s just hard to be. If you could have one magical ability what would it be?There are two magical abilities I’d love to possess: I would love to be able to fly like a bird – to be able to soar to unimaginable heights and to be able to float on the winds would be so majestic. And I’d love to be able to make myself invisible, for so many reasons! With which animal do you feel the most affinity? Dogs. They are the epitome of unconditional love. What makes you laugh? When I see other people laugh uncontrollably. I love to see that! What is your favorite movie? I have so many favorites! I love murder mysteries, psychological thrillers and crime dramas and Suspect, Seven, Copycat are a few of my favorites. I love war movies, especially Vietnam War movies and Platoon, Saving Private Ryan (WWII), Hamburger Hill (WWII), We Were Soldiers and Full Metal Jacket are favorites. I LOVE Alfred Hitchcock films. If money were no object what would you do? Buy a huge parcel of land and build an animal sanctuary where animals would come to rehabilitate after surgeries or injuries and it would be a rescue haven for victims of animal cruelty and neglect. I would also like to take in old dogs from shelters who are not considered adoptable and give them a good life for the rest of their years on my parcel of land. In addition to dogs there will be horses and chickens and goats and sheep, plus lots of paid help and an onsite veterinarian. And on that land, I’d build a fabulous home with an amazing yard and a huge pool in the backyard. I’d build my dream home. If you could travel to anywhere in the world, where would you go and why? To all parts of Europe, especially the Czech Republic because I want to see the land from where my grandfather hailed. Check out my blogroll for other cool blogs! This entry was posted in Posts and tagged blog awards, Liebster Award, Sunshine Award, Wonderful Team Member Readership Award by greyzoned/angelsbark. Bookmark the permalink. Thanks for the mention. Nice to learn more about you. Long live 70’s music! I love the Den, Debbie! Thank YOU! I had to pay for the statue. I got the award recognition but if I wanted to have the statue, i had to pay for it! It’s a lovely statue so yes, I paid for it. I earned it, after all! 🙂 That’s the way to do the awards, give them out with no conditions! I think people will be very receptive and very grateful for that for sure! Good for you! Thanks for mention, Michele. 🙂 Interesting answers. Not long until your favourite season kicks in. Thank YOU Frankie! I’m so looking forward to the Fall. The summer heat is getting to me, but as soon as I start seeing stuff about football, I know my season is just around the corner. Hard to believe that football season is almost here again! Happy Trails. How’s life on the road?? Congratulations on all your awards michelle!!! You are an AWESOME writer and an AWESOME person!! Love you!